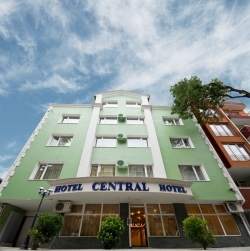 Hotel Central is situated on a quiet street in the downtown area of Burgas, approximately 500m from "Troikata" plaza, 1.5km from the central railroad and bus stations, and 1,8km from the beautiful beaches that the city has to offer. 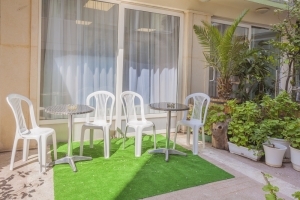 The hotel is quiet and cozy and offers comfortably furnished rooms and suites for your business trip or vacation. We gladly offer all services you may need during your stay with us. We will wake you up in the morning, call a taxi, and even have your business attire dry cleaned. 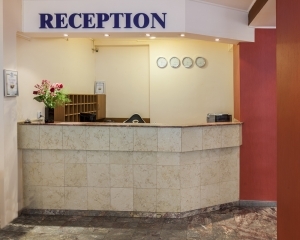 The hotel's reception desk is open 24/7 and offers safety deposit boxes free of charge, as well as complimentary Wi-Fi access throughout all of our facilities. Our 24/7 cafe serves tea, coffee, soft drinks, juices, water, beer, and other beverages, as well as breakfast for additional charge. The hotel has an underground level parking garage with 8 designated spaces for the safety of our customers' vehicles. Hotel Central offers a fully equipped conference room with AV technology that accommodates up to 40 attendants. There are restaurants with Italian and Bulgarian cuisine in the immediate vicinity, as well as multiple cafes, supermarket, and rent-a-bike station. Also, we are 300m away from the famous farmers' market, where you can find traditional bulgarian spices, fresh produce, and souvenirs.